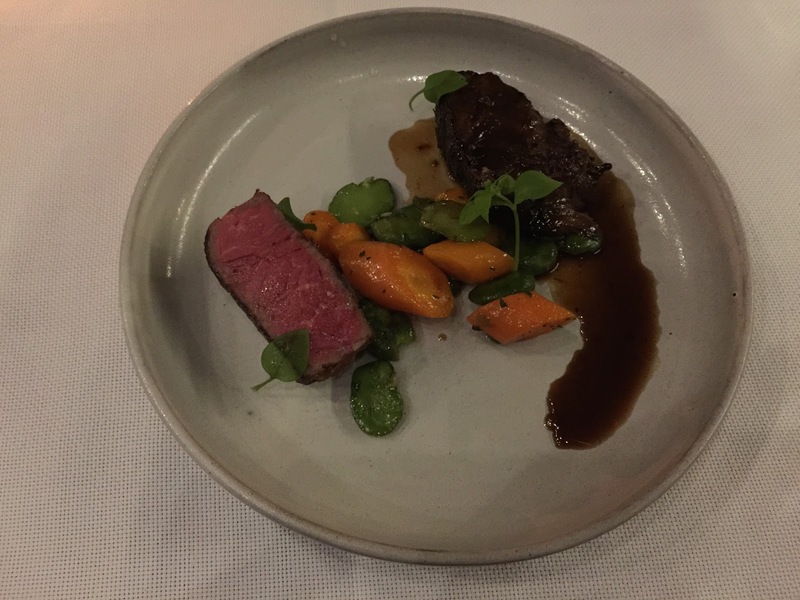 In a recent post, I promised a more complete review of my meal at Bryan Voltaggio's Aggio restaurant in Baltimore. 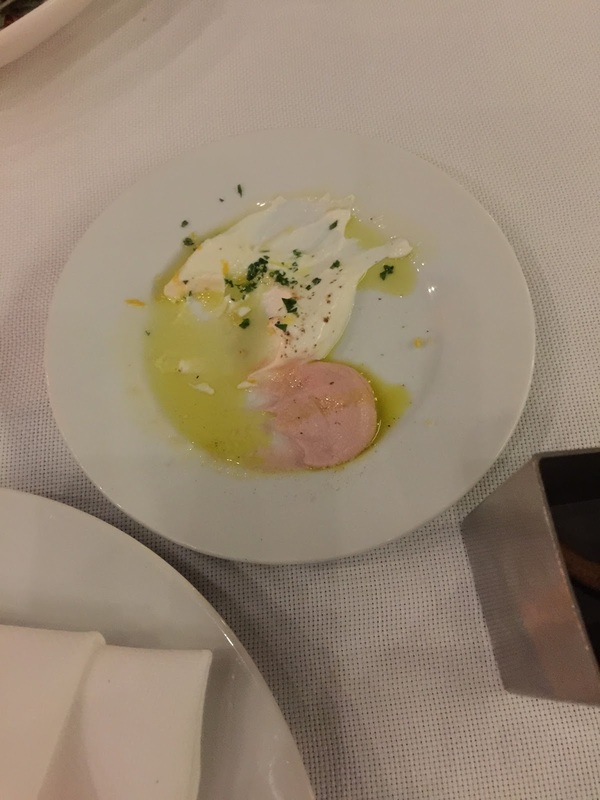 Though I enjoyed the dinner overall, it was decidedly uneven. The restaurant is an attractive blend of modern hipster and old-school Italian looks. I know it sounds odd, but it works. So far, so good. 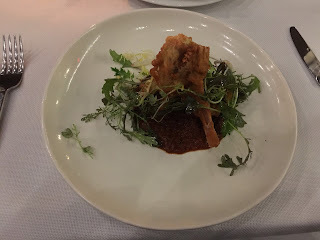 Given Voltaggio's good and growing reputation, we decided, as I frequently do, to opt for the tasting menu, which featured five courses. Again, so far, so good. The first item to appear at our table did not bode well: boring and rather dry bread sticks. Two cheese spreads proved tasty and definitely helped the bread. The first real course placed parts of a soft-shell crab on a bed of greens and delicious red sauce. The next course knocked our socks off. 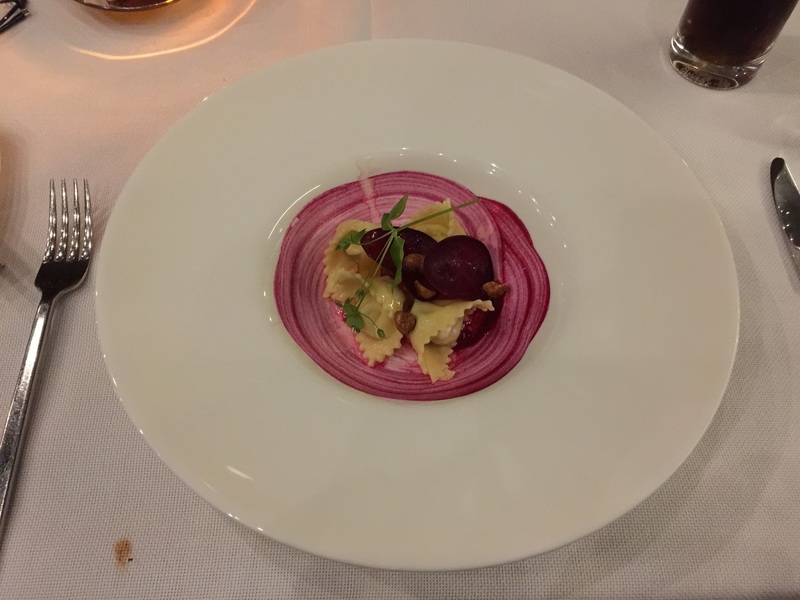 A tortelletti stuffed with gorgonzola dolce and covered with pine nuts and subtle baby beet slices, this pasta was so good I would have happily made the rest of my meal a big bowl of it. At this point, we were excited about the next course, having a good time, and ready for more. We then waited. And waited. And waited. 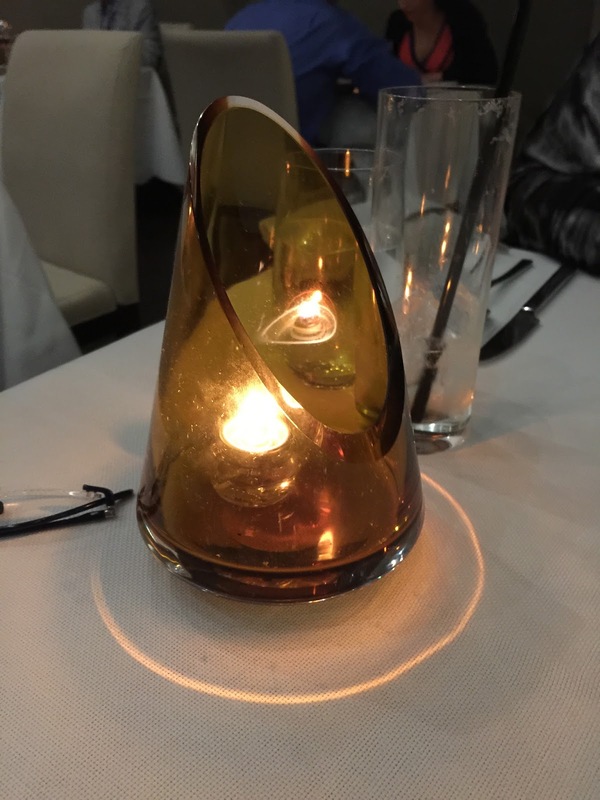 At one point, I snapped a picture of the candle holder, which I do confess to liking. 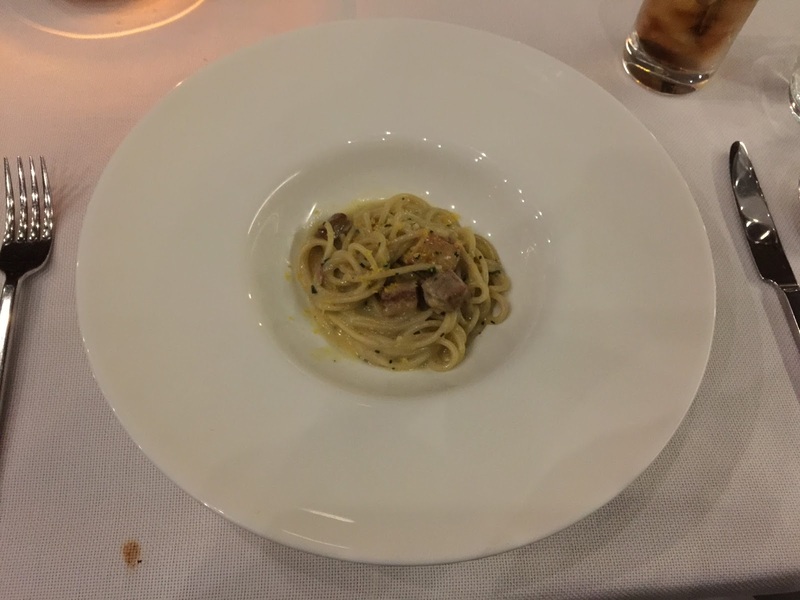 After an apology from our server and more waiting, we finally received the third course, another pasta dish. This small helping of spaghetti carbonara with house bacon and cured egg yolk tasted completely different from the previous dish but was equally delicious. A giant bowl of this stuff would make you right on a cold night. The final savory dish mixed a small piece of strip steak, a similar amount of beef cheek, and a carrot and fava bean ragu. 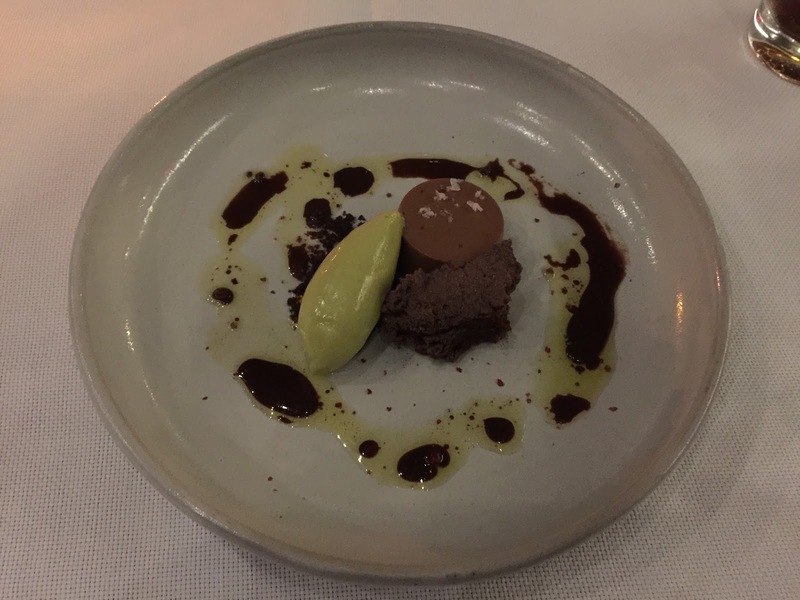 The beef cheek tasted rich and flavorful, though it wasn't a patch on the one Gabe Rucker serves at Le Pigeon. The vegetables were adequate but no more. The strip steak, despite being the ostensible star of the dish, was mediocre at best: chewy, weak-flavored, and not even properly salted. Had I tasted only this dish, I would have been tempted to write off the restaurant. The final course, dessert, proved to be a big step up from the meat course, but it was nowhere near as good as the pastas. The chocolate custard and the pistachio sorbet were tasty, as was the other bit of cake. They were not, however, particularly memorable. All in all, the recommendation I gave in that earlier entry stands: go to Aggio for the pastas, because the two that I sampled were spectacular. I'd be wary of the other dishes, though, and I would not plan on great service. 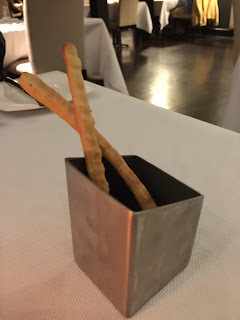 I do hope to eat there again, because those pastas were so strong that they made the trip worthwhile and because the other issues were easily fixable. Perhaps at next year's Balticon.